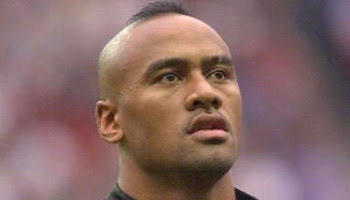 The man who changed the game forever, Jonah Lomu is a living legend. The poor guy is in the progess of trying to make a comeback, but doesn't quite seem up to it any more. After what he's been through, I'm not surprised. In his prime he was unstoppable though. Just for the record - he NEVER scored a try against the Springboks in all his years. The Legend provided me with one of my favourite moments when he ran over the 3 England players at the world cup. Fantastic. He is a very inspirational player with a very inspirational story. He is a real super hero! Sorry Derek, I'll pay for the dentist. I don't want to sign up for yet another blog hope this gets thru.